Room 214A - before the entrance to the women’s restroom. McDowell Hall room 214A at north end of University of Delaware provide a safe, clean, private and comfortable nursing mothers room on the north end of campus for mothers to express breast milk for their infant children. 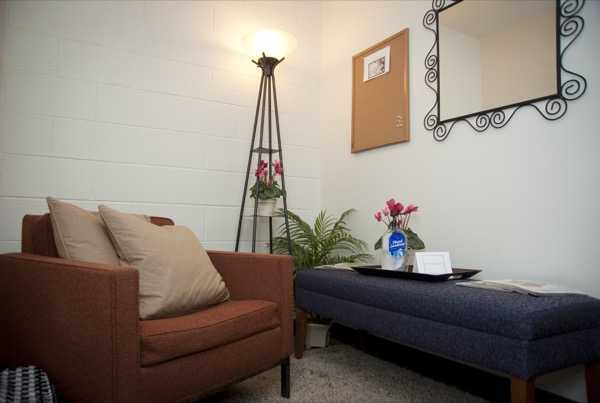 Comfortable couch, soft lighting, a socket for electric breast pumps, ottoman, bulletin board to share feedback, and door is lockable to prevent unexpected entry. All three of the nursing mothers rooms on campus are available to any faculty, staff, student or visitor when then buildings are open, and operate on a first-come, first-served basis. Note: State of Delaware breasftfeeding law also protect a mother's right to openly breastfeed whenever and wherever she is allowed to be in public or private places.